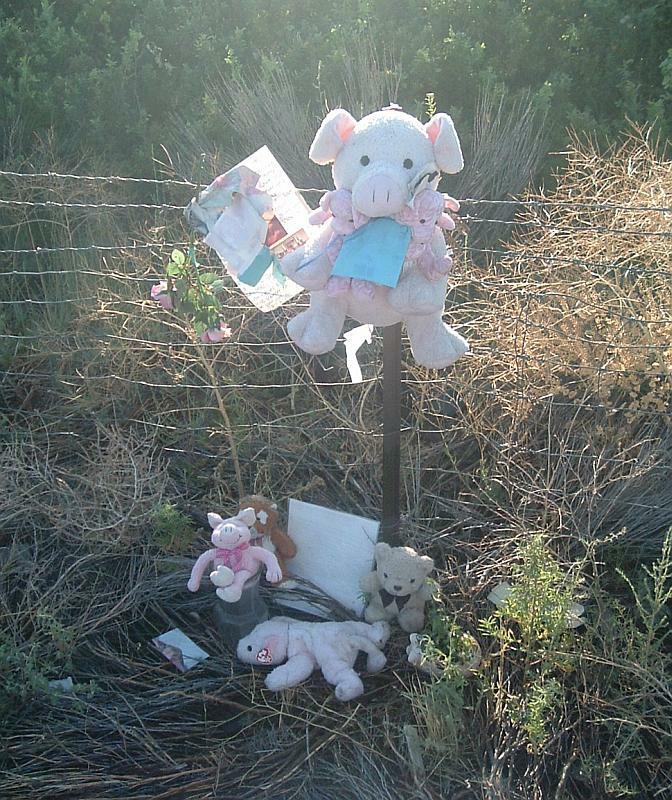 Someone has been moving the roadside memorials on Hwy 395 through Douglas County, and nobody’s owning up to it. That’s the gist of this article at the Nevada Appeal. Douglas High student Nicole Snyder was killed July 12, 2004, when an oncoming car hit the center divider, flipped, and landed on top of her car. Her friends soon gathered and put together a memorial at Genoa Lane for her. And 17-year-old Bridget Chambers died July 15, 2005, at Stephanie Way when an elderly driver made a left turn right in front of her. A roadside memorial also sprung up around a streetlight there, and the accident prompted calls for a stoplight at that intersection. Now Bridget’s memorial, or a small part of it at least, has been moved back to the fence at the side of the road. The rest of it is gone. And Nicole’s memorial has been completely wiped out. 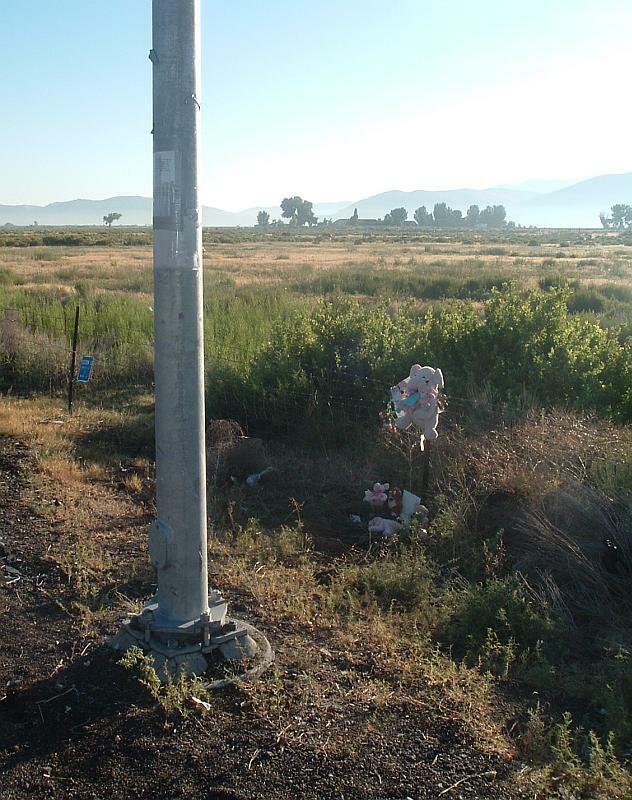 The most likely cuplrit would be the Nevada Department of Transportation, since they’re the ones in charge of keeping the roadside clean, and they’ve removed similar memorials before. But this time they deny that they had anything to do with it. So we have a mystery on our hands. And that leaves me wishing I had a better memory. Because I actually saw the guys that were removing Bridget Chamber’s memorial, but I didn’t pay close enough attention to what was happening, and can barely remember the few details I did pick up on. It was earlier this week, maybe Monday or Tuesday, and I was driving to work. As I turned the corner from Stephanie, I saw two men with orange vests and a State truck picking up the items from the memorial and stuffing them in plastic bags. I didn’t take a close look at the truck, but I assumed they were NDOT, because they’ve done this to other memorials before. Especially memorials like Bridget’s, which over the previous week had become a collection of stuffed animals, candles, notes, letters and poems. They might not have been NDOT, though, because they had a white truck and most of NDOT’s road crews drive orange trucks. So maybe they were Douglas County? I’m really not sure. I should have stopped and snapped a picture of them, but I’m a little timid about taking pictures of strangers, or even stopping and asking them what they’re doing. I guess I don’t make much of a citizen journalist. But I did stop by this morning and take a couple of pictures of what’s left of the memorial. The corner of Hwy 395 and Stephanie Way in Douglas County. In the foreground is the streetlight where Bridget Chamber’s memorial used to be. In the background, against the fence, is where some of it was moved to. The rest was taken away in plastic bags by two mysterious men. What remains of Bridget Chamber’s memorial at Stephanie Way. I’m thinking that I could build a section at Around Carson to preserve these memorials. Because they spring up so spontaneously after someone’s lost, but they usually don’t last very long. They’re either removed by highway crews or washed away by the elements. So I should build a web page where we can preserve pictures of the memorial before it gets taken down, and provide a way for everyone to leave their memories and tributes. Things in the real world may fade and be forgotten, but on the web their memories can live on. Anyway, if you have any thoughts on this, or tips as to who might have removed these memorials, leave a comment. There’s also a forum topic for this.